Once the truth of the misunderstanding is understood, it is too late. The speaker releases ninety-nine more red balloons in honor of what was lost. Note: I once again deferred to my wife’s expertise with German- she says the translation is not as good as After the Fire’s translation of “Der Kommisar” – but it tells a similar story as the German lyrics that is a bit softer, but captures the same sentiment. Big Country were very successful in Europe, but they only had one big hit in the U.S. – “In a Big Country”, which peaked at #17 on December 3, 1983. Big Country are a Scottish rock band that formed in 1981. In 1983, the band released the single, “Fields of Fire”, which reached the UK’s Top Ten. They quickly followed this up by releasing the album The Crossing. The album contained the hit “In a Big Country”, which helped it become a big seller in the U.S.
Their second album Steeltown (1984) was a hit as soon as it was released in the U.K. However, it was a commercial disappointment in the U.S. The band continued to release albums and tour throughout the ’80s. Throughout the ’90s, Big Country became a popular ‘opening act’, supporting such bands as Rolling Stones and The Who. Meanwhile, lead singer, Stuart Adamson struggled with alcoholism. In 1999, Big Country released their eighth album, Driving to Damascus, and it did not do well at all. Adamson said publicly that he was disappointed that the album did not fare better on the charts, which led to depression. Later that year, he disappeared for a while before resurfacing, stating that he had needed some time off. Adamson returned for the band’s ‘Final Fling’ farewell tour, with their last concert being in October 2000 in Kuala Lumpur, Malaysia. In November 2001, Adamson disappeared again. He was eventually found dead in a room at the Best Western Plaza Hotel in Honolulu, Hawaii on December 16, 2001. The official autopsy revealed that he had hanged himself. At the time of death he had a blood-alcohol content of 0.279%. In 2007, to celebrate 25 years of Big Country, founding members Bruce Watson, Tony Butler (now lead vocalist for the first time), and Mark Brzezicki reunited to embark on a tour of the UK with dates in Scotland and England and a gig in Cologne (Germany). They also released a new album, twenty five live, on the trackrecords label. Arguably, “Far From Over” was the best part of Staying Alive, the sequel to Saturday Night Fever. 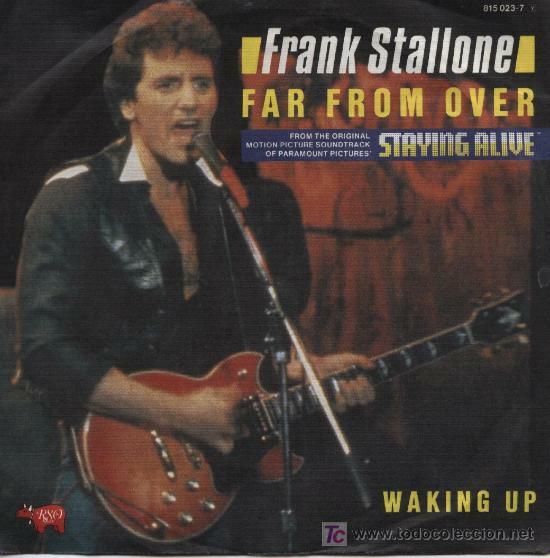 Frank Stallone (younger brother of Sylvester Stallone) wrote the song along with Vince DiCola. “Far From Over” peaked at #10 on October 1, 1983. It was nominated for a Golden Globe award for Best Original Song from a Motion Picture and a Grammy Award for Best Album of Original Score Written for a Motion Picture or Television Special. Stallone has released several albums over the years. Being a huge Frank Sinatra fan, his albums have been Big Band/crooning style music. So, he has not had another major hit since “Far From Over”. In 2008, he went on tour with his own Frank Stallone Band, which featured himself on lead vocals and rhythm guitar. “Puttin’ on the Ritz” was actually written by Irving Berlin in 1929. There have been many versions of the song. Fred Astaire performed the song in the 1946 movie, Blue Skies. Then the song was performed by Gene Wilder and Peter Boyle in the 1974 Mel Brooks film, Young Frankenstein. 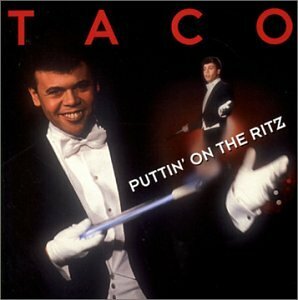 Taco released his version in 1983, and the song peaked at #4 on September 3, 1983. His version includes a tap dance solo in the middle to honor Astaire. Taco did not have another hit after that. His follow-up song, “Singing in the Rain” was only a moderate success peaking at No. 49 in Germany and No.46 in Canada. After recording a few more albums, Taco focused more on acting, and appeared on some German television shows. He currently resides in Germany, performing with his band and as a gala artist.